Carol Ordogne always meant to be an artist when she left her native California to study art in Hawaii. Upon earning her degree she, like many artists, took a new direction. She moved to Louisiana and studied Landscape Architecture. After graduating she started her own practice designing “living sculptures”, otherwise known as “gardens”, for her customers. She now enjoys being passionately involved in fine art once again. 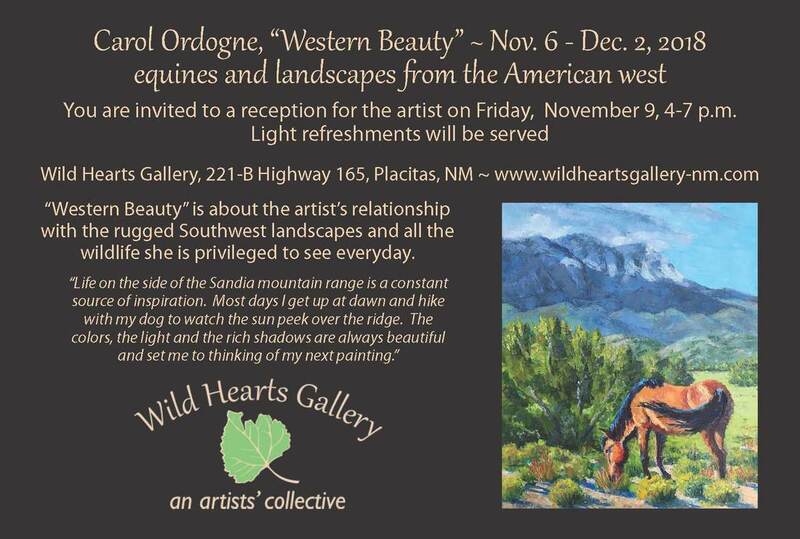 Carol is in love with painting the rugged Southwest Landscape and all the wildlife she is privileged to see everyday. She is finding her artistic voice most recently in large plein air landscapes done in a single session with oil paints and a pallet knife. Her studio work is tending towards large equine paintings done with a pallet knife plus smaller paintings done with a brush. As an exercise in learning the names of a variety of local birds she does small oil paintings of each of them.